Xenia Scouts Kyle Carnahan (16) from Washburn University in Topeka, Kan., slides safely past the tag of Lake Erie Monarchs catcher Sammy Stevens, of Georgetown University (Ky.) for a fifth-inning score during Thursday’s Great Lakes Summer Collegiate League season opener at Grady’s Field, in Xenia. 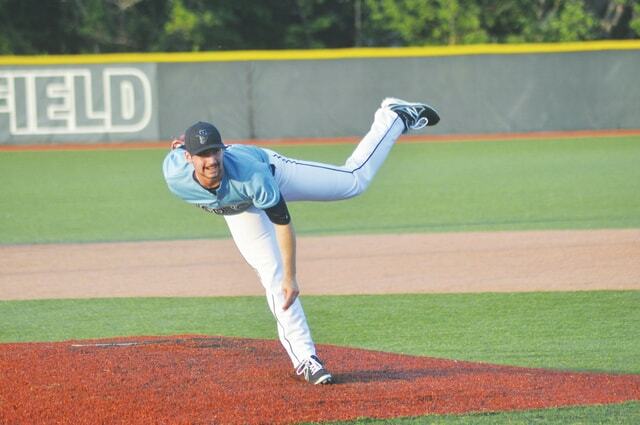 Starting pitcher Quentin McGrath, of East Central University in Ada, Okla., limited the visiting Lake Erie Monarchs to just one hit through six innings of work, Thursday evening at Grady’s Field on the Athletes in Action campus. Xenia led the game, 4-0, after seven innings of play. XENIA — Like the summer baseball season itself, the Xenia Scouts baseball team is just as new. Prior to Thursday night’s Great Lakes Summer Collegiate League home opener on Grady’s Field on the Athletes In Action campus, new Scouts manager Bubba Cates was still getting familiarized with his players’ names. The team’s website boasts a roster of 21 college baseball players from 17 colleges and universities, in all divisions of college ball. There are two players each from Union University (Tenn.), Washburn University (Kansas) and Hillsdale College (Mich.), and there are Division I players from Baylor (Texas), Xavier and South Florida as well. “We’re excited. We had a good ballgame on Tuesday night in a win over the Cincinnati Spikes. We didn’t play our best ball, but we’ll get better. The other team was about like we were, where we were trying to get used to each other. Cates was the manager at the University of Tennessee-Martin for 15 years. He was a collegiate assistant coach and a high school baseball coach for several years before that. He got to talking with John Henschen of the Xenia Scouts during the amateur baseball winter meetings in Florida. “I’ve known the Athletes In Action program for a while. My oldest son played ball for an AIA team. They had a one-year team in Florida, and he played on that team. And so I knew what the program was all about. The Athletes In Action sports ministry, based in Xenia, has collegiate summer league baseball teams in Chugiak-Eagle River, Alaska, Rochester, N.Y., Xenia and the Dominican Republic. Through seven innings of play in Thursday night’s game, the Scouts held a 4-0 lead and had limited the visiting Monarchs to two hits. Xenia heads north into Michigan to play the Monarchs for a 7:05 p.m. game tonight. They head over to Lima to play the Locos at 7:05 p.m. on Saturday, before returning to Grady’s Field on the AIA campus to host Lima for a 4:05 p.m. Sunday contest.